Effective December 6, 2018 - Pursuant to a board approved modification in grant policy, the foundation will no longer accept unsolicited applications for capital campaign support. We will internally investigate campaigns currently underway and extend invitations at the appropriate interval. 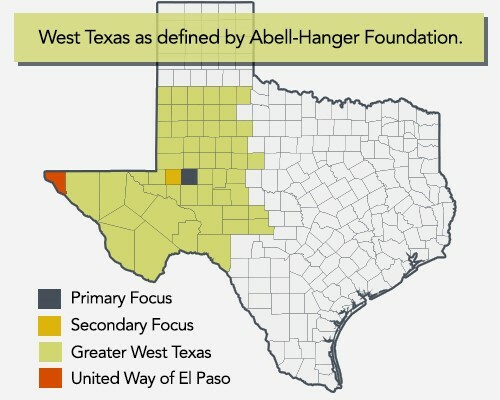 Currently, giving is focused to the 57 counties of West Texas as defined by the Foundation. Any organization located outside of this area, will be considered based on the services provided to this region. The applicant organization must be determined by the Internal Revenue Service to be exempt from federal income tax. Applicants must provide a copy of their IRS Determination Letter of Ruling identifying their organization as exempt under section 501(c)(3) and exempt from Private Foundation Status under Section 509(a). Applicants who are exempt under a Government Municipality must also provide proof to such. All grant applicants seeking funds for a capital campaign (defined as a campaign seeking to raise $1 million or more) must have received an invitation from the foundation to do so. All requests from universities or colleges should be approved by the development office of the university or college and submitted to our offices under cover letter from the development office. The Foundation does not make loans or grants to individuals. The Foundation generally limits its educational grants to institutions of higher education, including religious educational institutions. Applicants must seek funding for the same proposal from various sources, as sole support of programs is rarely undertaken. Due to the number and magnitude of requests received each year, the Foundation cannot respond favorably to all requests. Thus, grants are made without any commitment for future support of operations or specific projects. All grant requests must be submitted online through the application portal. Organizations submitting a paper application will be asked to resubmit digitally. 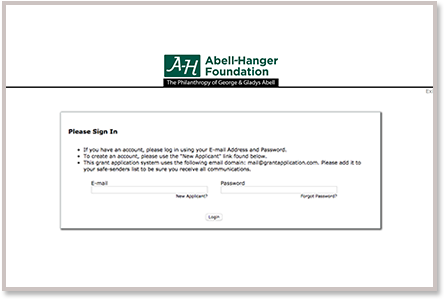 Any organization that has received funding from Abell-Hanger Foundation in the last two fiscal years or any nonprofit organization located within Midland County will be asked to submit an “Intent to Apply” prior to receiving the application form. All other organizations will be required to first submit a “Pre-Application Request” which are reviewed by the trustees every 4-6 weeks to determine their level of interest. If interest is shown, you will be given instructions regarding the submission of a grant application and deadline. You will also be notified if your Pre-Application Request has been declined. Both the Intent to Apply and the Pre-Application Form will be completed through the portal. Pre-Applications are reviewed every 4-6 weeks. Grant applications are considered four times a year. Organizations may not apply for the same or similar funding more than once within the Foundation’s fiscal year (7/1 – 6/30). Deadlines are listed here. When completing an application, you will be asked to download Adobe Acrobat PDF forms for completion to be attached and uploaded to your application. WHERE THE FORM IS PROVIDED, YOU MUST USE THE FORM. FORMS FROM ANOTHER WEBSITE OR SELF DESIGNED FORMS ARE UNACCEPTABLE. Should you have any questions, please call Helga Hoban at 432-684-6655 or complete the form below. County List: Midland and fifty-six counties in West Texas: Andrews, Bailey, Borden, Brewster, Crane, Cochran, Coke, Cottle, Crockett, Crosby, Culberson, Dawson, Dickens, Ector, El Paso (United Way only), Fisher, Floyd, Gaines, Garza, Glasscock, Hale, Hockley, Howard, Hudspeth, Irion, Jeff Davis, Kent, Kimble, Lamb, Loving, Lubbock, Lynn, Martin, Menard, Midland, Mitchell, Motley, Nolan, Pecos, Presidio, Reagan, Reeves, Schleicher, Scurry, Sterling, Stonewall, Sutton, Taylor, Terrell, Terry, Tom Green, Upton, Val Verde, Ward, Winkler and Yoakum. Deadline dates are reset annually by the foundation. Please be aware of dates for your application submission process.